Equipment: All rented. As #53. Notes: Out of the water. Straight back in again, the surface interval mainly due to the surface swim of the previous dive. Not too exciting. Mismanaged camera batteries. Equipment: All rented. Well used. Notes: Continued tourism on the way south. 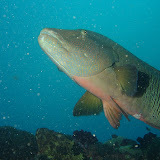 Disappointed with a failed triplet of dives from Agnes Water, and an unforgiving itinerary. Further on, an opportunity with a Bundaberg dive shop; the site was off Bargara (like the utterance of an incredulous Irishman! 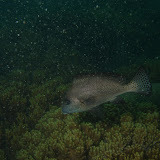 )- the very tail end of the barrier reef. Dead shallow. But a tortoise! Dodgy navigation made for a long surface swim, hampered for G by a half-broken rented fin. Equipment: As previously, all rented from shop. Notes: Much better. Lots of the same niceness, but with a seemingly slacker current, or at any rate, one that was easier to manage when expected. Coral encrusted toilets! Spotted after a long spell staring dumbly at the guide repeating his mime with commendable patience. A brief moment of elated enlightenment followed by an underexposed and then an overexposed photo before the momentum carried me on. Lots of colourful life on the planar hullside. Back. Food and forgotten swimmers. On and away for more land-based tourism: Eungalla national park. Endless confusion. Equipment: All rented from shop. Notes: Not bad. Some well timed travelcalm neutralised the bouncy outward trip. Not the utterly ineffective natural version, which might have wasted my $240. The rented gear was well worn, ok but for paltry foot flippers. Need to be self sufficient, propulsion-wise, if there’s a risk of being stuck with them again- especially on a dive like this with a strong current. Submerged. Slightly leaky mask (too tight again?). Stinging watering eyes: Sea Gold and insufficient rinsing. Solved by a bit of voluntary flooding. It did the trick on the defogging front though. The wreck lies on its starboard side. To begin, an easy drift deckside from bow to stern. An abundance of everything. Somewhat overwhelming in fact, on this first dive. An upcurrent struggle returning to the bow. Had to abandon the hullside route in favour of some shelter back the way we had come. It felt like futile foot-flipping, heaving precious air. A glimpse of a big gliding eagle ray. Eventually, relative calm. Slow, two-stop ascent. Snap happy when I wasn’t working too hard- results in the next post.